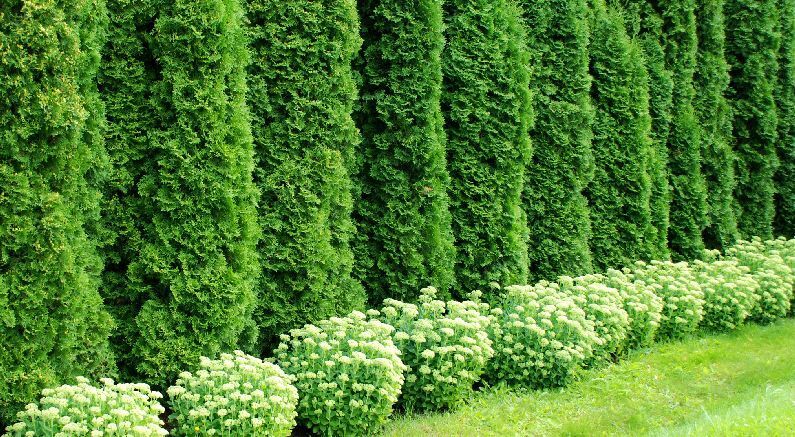 Both Emerald Green and North Pole Arborvitaes are of the same species (known as Eastern White Cedar or Northern White Cedar) that grows fast, tall and they both stay quite narrow without pruning. If you plant them closer together, they make a solid screen sooner. 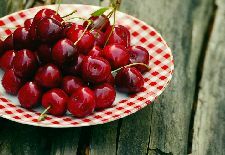 Both of these varieties can be planted every three or four feet and just allow them to grow and touch each other. There is no need to keep the plants trimmed to prevent them from touching but you want them to mesh together and make a nice solid green screen. And Spring Grove, Green Giant, and Sugar and Spice are all the species plicata (known as Western Arborvitae). The interesting thing about these three varieties, the deer find them less desirable once they get up a few feet tall. These three selections look fantastic if you use them in a more natural untrimmed form. A somewhat staggered informal planting in groups of three of fives is wildly desirable. These western Arborvitae selections are also incredible windbreaks and screening plants in smaller and larger numbers. All Arborvitae are simply grown with few problems in areas that have sufficient moisture. Watch the hardiness zones in which they grow within as they are for zones 3-9, but each one is specific to a range of northern zones. 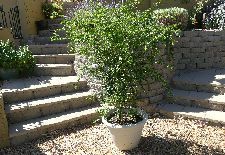 The container plants that Nature Hills sells are the perfect sizes to establish new plantings of both species of Arborvitae. Water carefully at the start making sure not to allow them to dry out. Once established, they will appreciate a drink during dry spells and it’s always a great idea to water before winter cold freezes up the soil. Arborvitae are green screens in which many are quite narrow not using up lots of space in your yard. Blocking out ugly views, creating amazing backdrops to your favorite shrub and perennial borders, or even used to reduce your energy bills from blocking those cold winter winds if they are planted on the north and west sides of your home. Left natural, they work beautiful with natives and a freeform style. Formal gardens use Arborvitae trimmed in formal hedges and in living sheared walls that are easy to maintain. 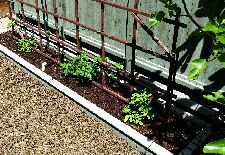 If you trim back the tops of the plants, you will encourage the plants to become wider. 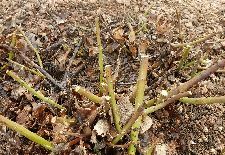 It is an extremely useful tip if something were to damage the bottoms of your Arborvitae. It is one of the only evergreens that are able to generate new growth near the bottoms of the plants…good to know. 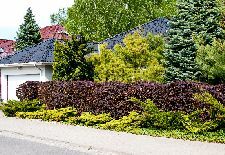 Most all Arborvitae can be trimmed or sheared into formal hedges, but you can also just allow your Arborvitae plants grow naturally too. Whatever landscape they are being used in (formal or more informal) you can choose how you would like your plants to be used. Let the tree of life breath some life into your landscape!